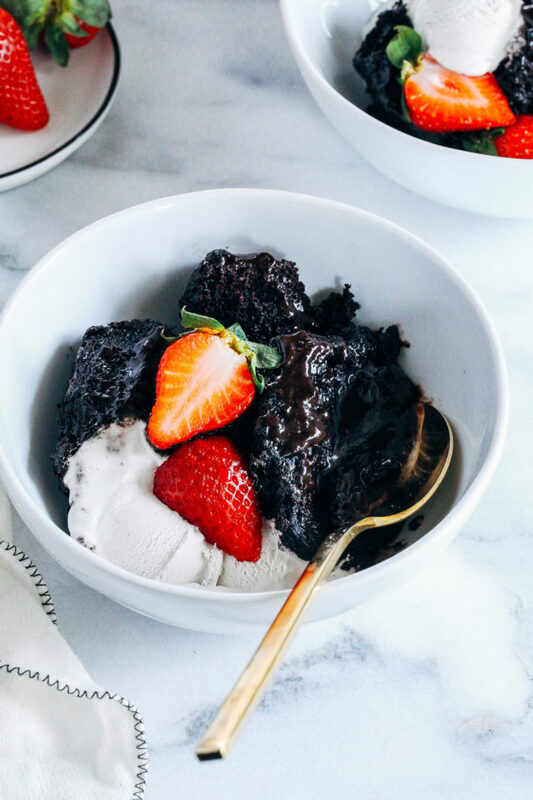 Hot Fudge Chocolate Avocado Cake- made with whole grain flour, coconut sugar and ripe avocado, you’d never guess this sinful dessert is vegan and oil-free! Happy Valentines Day! You didn’t think I’d forget to share something chocolate with you, did you? No way, Jose. If you’re like me then you have to have chocolate today. It’s like a tradition. One that also carries through every other day of the year, but who’s counting? I might be sharing this a little late considering most of you probably already have plans for tonight. But honestly the ingredient list for this is so basic, it’s possible that you already have everything you need. 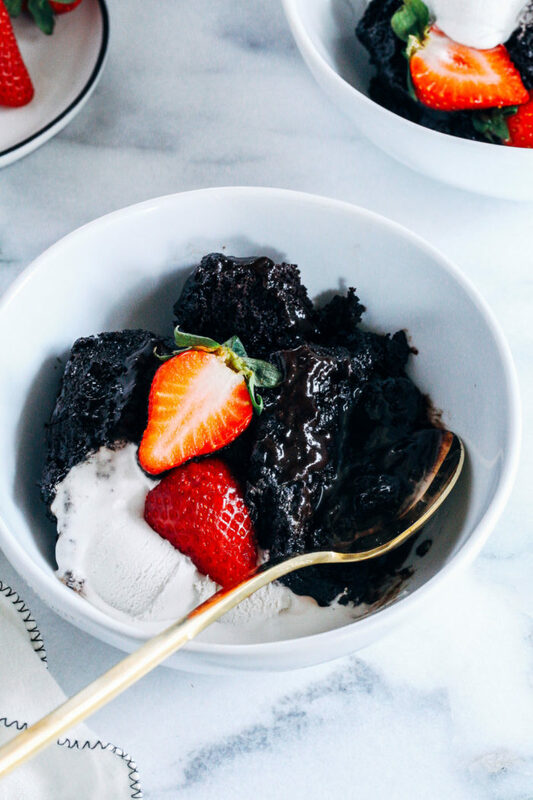 This Hot Fudge Cake comes together with a simple combination of spelt flour, cocoa powder, coconut sugar and ripe avocado. 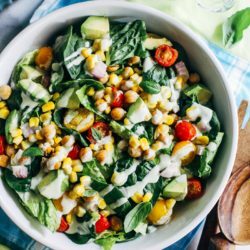 In fact, avocado is the only fat in the entire recipe which makes this chocolatey deliciousness oil-free to boot. Now I know I have many readers who eat gluten-free. I have not forgotten about you! I did test this with oat flour and it was good. Not as good as the spelt flour version, though. When you go to the make this cake, you might be a little weirded out by the fact that you have to pour hot water over the top of the cocoa powder and sugar mixture. 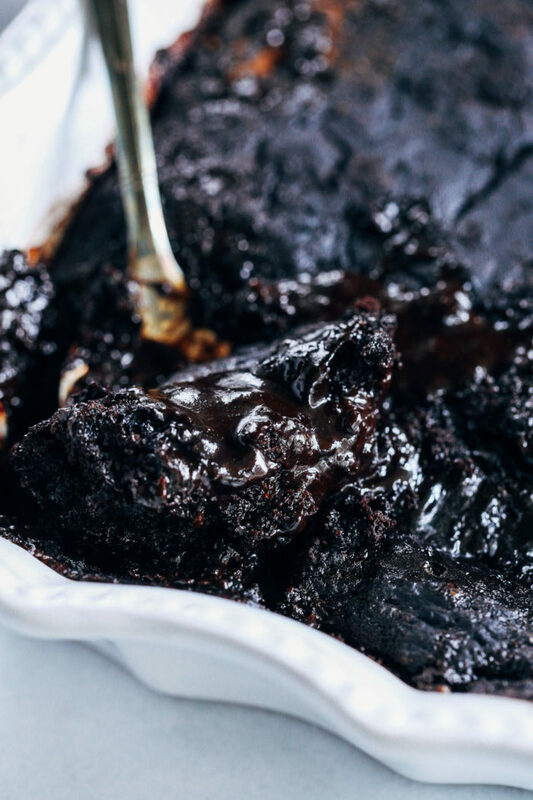 It’s totally normal, and it’s what creates the gooey chocolate hot fudge underneath. Overall this makes for a simple, yet decadent dessert with a little bit of nutrition hiding inside. It’s the perfect chocolate treat to whip up for someone you love. Just don’t forget the vanilla ice cream and strawberries! They’re kind of a necessity. Preheat the oven to 350°F then lightly grease an 9 x 9” baking dish. 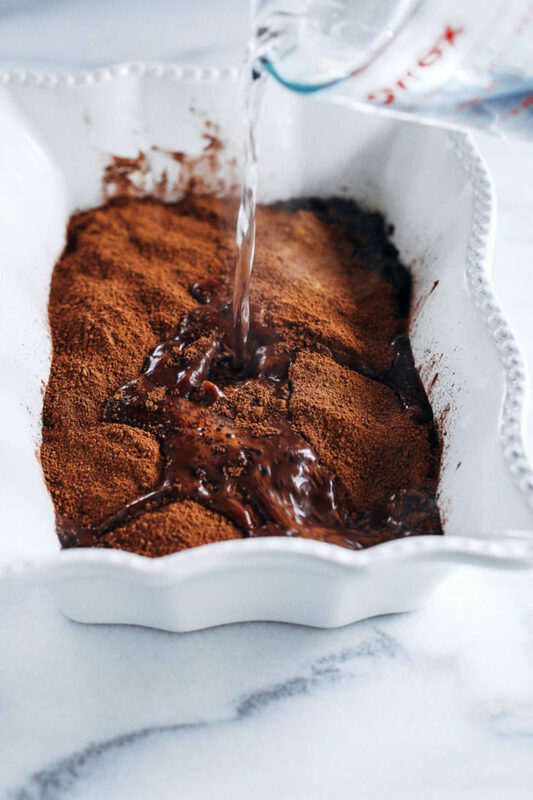 In a small bowl, combine 1/2 cup coconut sugar and 1/4 cup cocoa powder. Whisk together and set aside. In a large bowl, combine 1/4 cup cocoa powder, 1 cup spelt flour, 3/4 cup coconut sugar, 1 and 1/2 teaspoons baking soda, and salt. Whisk together and set aside. In a blender, combine 1/2 cup milk, 2 teaspoons vanilla, and 1/3 cup avocado. Blend for about 5 seconds, until smooth. 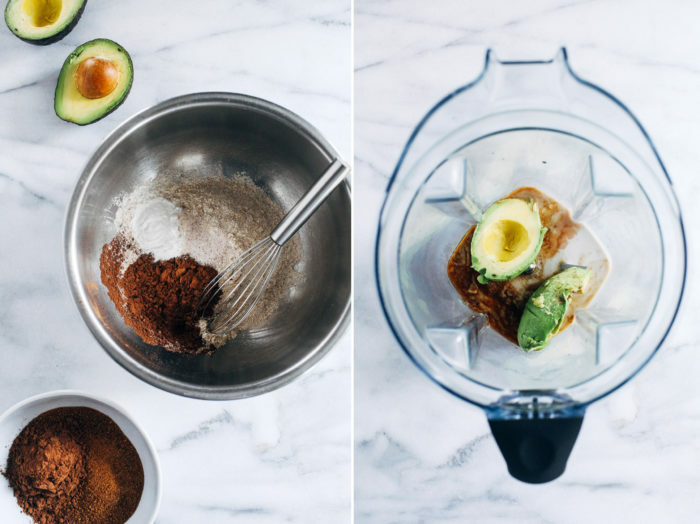 It’s okay if there are a few bits of avocado that are unblended. Pour the wet ingredients into the large bowl and fold together until well-combined. The batter will seem very dry, that’s normal, just keep folding until all of the flour has been incorporated. Transfer the batter to the greased baking dish. Use a spatula to smooth out along the bottom, then sprinkle the sugar and cocoa mixture from the small bowl over top. Pour hot water evenly over the top layer so that all of the cocoa powder/coconut sugar mixture is covered. Do not stir. Bake for 30-35 minutes then remove and allow to cool for at least 15 minutes. 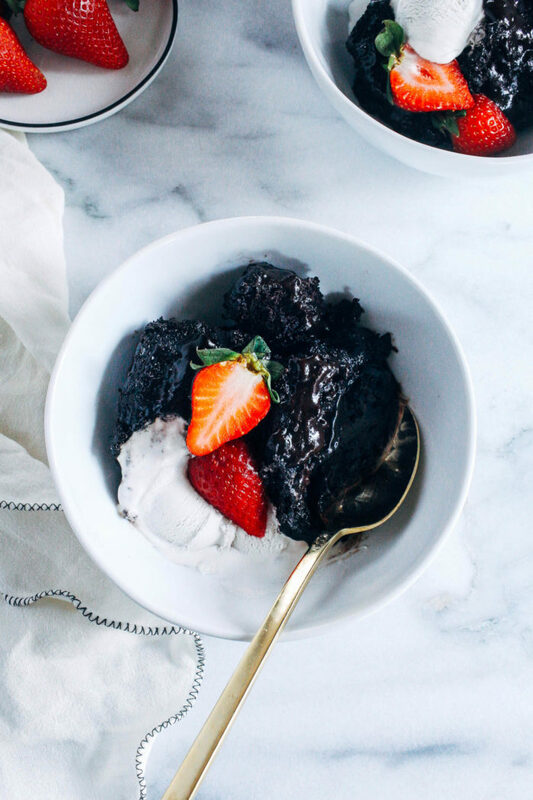 Serve warm with hot fudge on the bottom of the cake, dairy-free ice cream and strawberries. *I did test this with oat flour and it was good. Not as good as the spelt flour version, though. 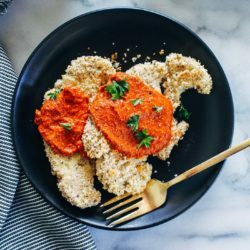 The texture is better with wheat flour so I recommend using that if you can have it. I’m dying to make a sweet treat for David but I’m battling some sickness. 24 Hour Flu maybe? Anyway I’m not leaving the house but I have all the ingredients on hand!! I’m going to surprise him with this. Yummm! I have some chocolate lava cakes from the freezer section of Trader Joe’s on hand for tonight, but this looks pretty damn good. I’ve seen avocado on recipes for stuff like this, but never actually used it, so I’m super intrigued. Happy Valentine’s Day! Holy guacamole!! This was sooo good!! 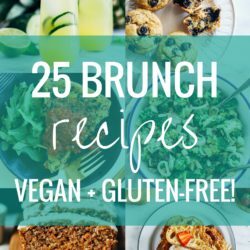 David and I loved it and I can’t wait to make it again and share with more people. I did modify a little by using all purpose flour because I was out of spelt but it was so delicious. I can’t believe how fluffy it was. David said he never would have guessed there was avocado in it. He also said it was like eating a chocolate cloud. It was super easy to make too. Thanks for the awesome recipe, Sarah! Oh those cookies sound incredible! Looks so rich and dark, just how I like my chocolate! I love chocolate every day so this isn’t late where I’m concerned! 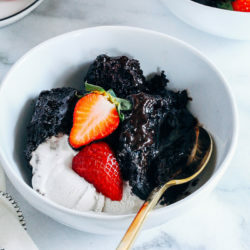 This looks so amazingly chocolate-y and decadent Sarah — I’ve got to try this. Hope you had a great Valentine’s Day! Thanks Marcie! Hope you had a wonderful Valentine’s Day too! I’m with you lady, chocolate on V-Day – and every day! I made some chocolate cherry cookies yesterday, and last night my hubby and I went out to a 3-course vegan dinner that ended with a red velvet raspberry cheesecake…. 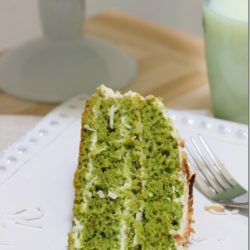 sooo good, I might need to recreate it! Oh my goodness, this looks so rich and fudgy! I’ve made brownies with avocado before and you can’t even tell! I can’t wait to try this. I made this last night and it was delicious! Master 7 & 5 are enjoying it for lunch! 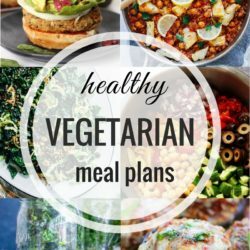 I’ve just discovered your page and loving your recipes!! So happy to hear that! Thank you for the review!